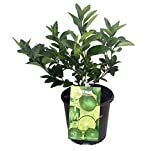 Lemon tree plant for sale – it is important to consider the size of tree your space can accommodate before buying a Lemon tree plant for sale. Different cultivars have different sizes. 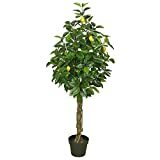 If you have a small area, it is recommended to buy a Meyer lemon tree as it is one of the smallest varieties reaching up to 10 feet tall and wide. Other varieties may reach up to 20 feet and may not be suitable for smaller areas. Lemon tree can be grown from seeds or root cuttings, most recommended it’s to buy start from grafted tree. The latter is a sensible option if you want fast yielding of fruits. However, you could also grow your own from seeds which will take time and effort in doing so. If you plan to buy a tree from root cutting, check and examine the trunk, stems and both sides of the leaves to look for signs of insects and disease before purchasing. Do not buy one with wilted, spotted or brown leaves. The tree should appear healthy. Soil – Lemon trees can tolerate even poor soil but it cannot tolerate “wet feet”. Pick a place with good drainage to avoid root rot. A soil pH ranging from 5.5 to 6.5 is ideal for lemons. You may plant them in the highest part of your property to avoid exposure to cold air that tends to stay low in the ground. Spread about 4 to 6 inches of organic compost from 6 to 12 inches away from the lemon tree’s trunk. Use compost, grass clippings, leaves or hay to keep the planting site free of weeds and to retain moisture and enrich the soil as it decays. Weather – the best time to plant a lemon tree is in the spring or autumn. Choose a sunny spot in your garden as these require full sun to grow well. Lemons are more sensitive to cold than other citrus plants, which is why they need protection from frost. Protect your trees by covering their canopy and trunks with blanket when the temperature begins to decrease. If you plant to place them in containers, you may transport them inside your house before the winter season comes. Water – water regularly to keep your lemon tree healthy and ensure quality fruit production. Newly planted trees should be kept evenly moist but not wet until they become established. Thereafter, watering once or twice a week in the absence of rain is enough, and lesser during the winter months. Pruning – You may prune your lemon tree all year round by removing dead and cross branches. Some people prune their trees to maintain its size and shape. Trees under four years of age require only minimal pruning. Harvesting –Citrus fruits can remain on the tree for weeks without suffering ill effects. You may harvest lemons as they ripen to meet your needs. If there are excessive amounts of fruits in the tree, try to harvest some of it. Allowing excessive amounts of heavy fruit to remain on your lemon tree can damage the limbs.